This wonderful combination is a sure favorite. 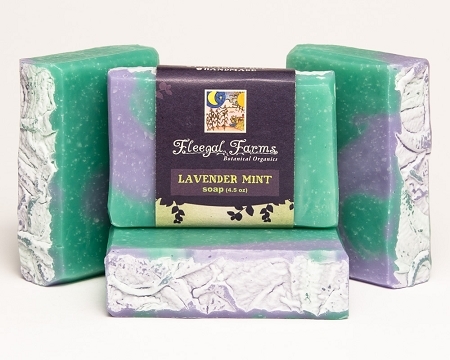 Sweet lavender blended into peppermint essential oil makes any every day bathing experience feel like a treat! INGREDIENTS: filtered rain water, saponified oils of olive (olea europaea), coconut (cocos nucifera), and palm (elaeis guineensis), pure essential oils, and natural mineral colorants. I stumbled on this soap by chance at a tiny gift shop in Wimberly Tx. I have sensitive (eczema/acne prone) skin, so I thought maybe the more natural the soap, the more gentle it will be. I started using it to wash my face and I was blown away! This soap cleared up my acne within days, it hasn't irritated my eczema the least bit, and leaves my skin feeling squeaky clean and so soft. I LOVE THIS SOAP!